Today I'm just going to talk about something that's been on my mind this week, which has been brought into clear focus by this great post by Monica. For me part of the fun, the thrill of improv is in not knowing exactly what happens next. I might have an idea of what I want to achieve, colours I plan to use, shapes I'm going to focus on, something I hope to say, but because not everything is planned there is always room for happy accidents. A couple of examples. My current WIP started with a serendipitous moment when I was scrolling through the black and white fabrics on a fabric website and found these two next to each other. I wasn't looking for a starting point for a quilt, but there it was and it niggled away at me for three or four weeks, until I went back and ordered both fabrics. The next example is from the same WIP and this is something I just noticed yesterday. This is in essence quite a simple idea: 9 patches and curved blocks combined in a way that pleases me and relates, in my head at least, to the photo I took as a starting point - not much more to it than that. But, as I add strips to my starting squares, to make them fit together, I am creating little secondary patterns. Look at the darkest square in the right hand section here - see the little rust coloured 'L'? ...even though I may make a plan in the cutting and the laying out of the pieces, it is more like writing a short story; I can fill it in and if there is a narrative element that kicks that outline awry, I can go with the new narrative element. As an aside, sometimes when I write this stuff I half expect someone to pop up and tell me it's all a load of bunkum. If I start producing nonsense, do feel free to let me know! No bunkum at all (like that word! ), a lovely post. I'm glad to hear that I am not the only one expecting to be told that I'm writing blog posts full of nonsense one day soon. I like the way your top is growing, thanks for letting us see how it progresses. LOL I love that word bunkum. I love your approach to creating, and I can definitely agree that finding gems like the rust L and then purposefully adding it into your design moving forward is a fantastic idea. I'm very glad to have inspired some clarity for you, Kaja! And yes, I agree, I don't think it's helpful to resist ideas as they come along. Run with it, and see what comes up next! I think I've used "rich" before for this project, but that really is how it feels to me. Wonderful textures. Onwards! Sometimes seeing two fabrics laying side by side is the perfect impetuous to start what turns out to be a great quilt. 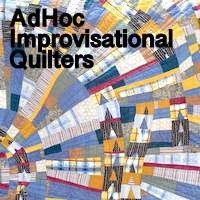 :) This quilt continues to be very intriguing to me! You're right, great post by Monica. I always enjoy seeing your ideas and projects. By the way, the creating process is just that, a process, sometimes meandering, sometimes way out there, sometimes spot on. Embrace it, you're doing great! No bunkum here! Love what you do. I'm trying to learn to be more confident in my own unfettered play. I have so many old projects I want to finish that I don't play much, but every once in a while I break of and do some. I'm getting more flexible. Still love watching folks work in this fashion!! I think the repetition of elements is what always makes your quilts so appealing--and the neat thing is that they come to you while you are constructing the blocks--not in an all-planned-out-ahead-of-time design decision. The juxtaposition of the L-shapes and the quarter circles intrigues me. I need the reminders to stop frequently to look at my work. So much better than waiting till it's all sewn. Great quote - i love how things change in the making and I've been deliberately colour clumping (that's how i call it) to give the eye some place to rest rather than be too scrappy and keeping things away from each other. No bunkum from me. I found the point about the L shape and then incorporating it very interesting and useful.